Alabama Severe Weather Tax Free Weekend announced for 2018 by Alabama Department of Revenue. (February 23-25, 2018) Alabama Severe Weather Preparedness Tax Free Weekend 2018 will begin on Friday, February 23rd, 2018, and end on Sunday, February 25th, 2018. This will allow Alabama shoppers to stock up on common supplies costing less than $60 that every home and business needs to prepare for a natural disaster tax free. Generators costing $1,000 or less also can be purchased free of the state’s four-percent sales tax during the three-day sales tax holiday. Alabama local governments have until January 24th, 2017, to notify the Alabama Department of Revenue if they will also waive their sales taxes on the covered items. Source. More information on Alabama Department of Revenue webpage, here. 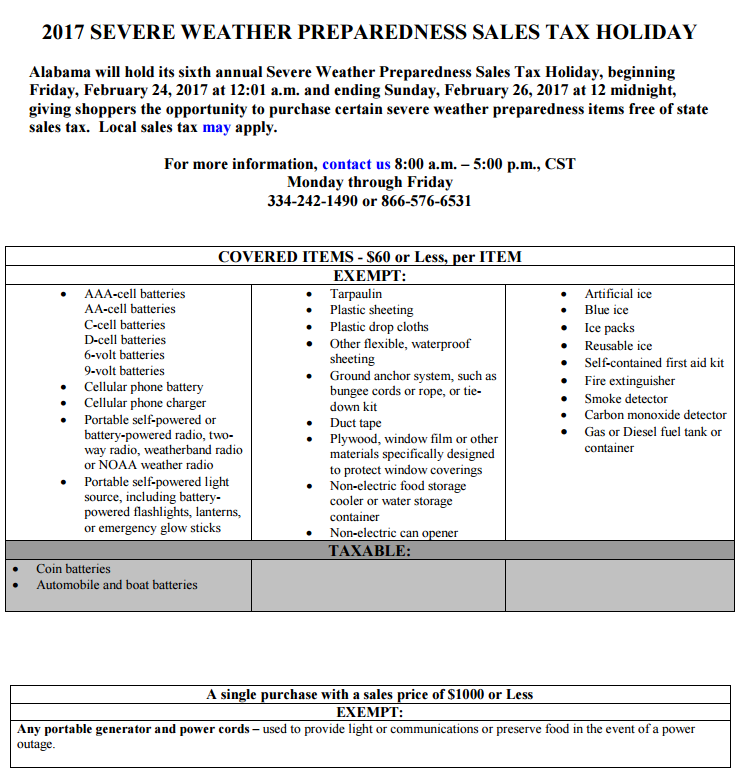 Will your locality be participating in the 2017 Severe Weather Preparedness Sales Tax Holiday? See if your city is participating in Alabama Severe Weather Sales Tax Holiday 2018. Were you looking for the Alabama Back To School Sales Tax Holiday?